Fits 32 oz Wide Mouth Mason Jar: Use our Zell fine mesh filter with a 32 oz (1 quart or 945 ml) wide mouth mason jar, like the affordable Ball Mason Jar, to make cold brew coffee, tea or fruit infused water. Easy to Clean & Dishwasher Safe: Make your own cold brew coffee easily without the mess using our stainless steel mesh filter. Clean up is quick and the coffee maker filter is dishwasher safe, top rack only. Large & Durable Filter: The extra large, heavy duty stainless steel filter allows a 1:3 coffee to water ratio that results in a strong coffee concentrate and less acidity. The fine mesh filter prevents grounds from entering the coffee. Brew Coffee, Tea & Infuse Water: Make a batch of delicious cold brew coffee. Add coffee grounds, let steep overnight and have cold brew coffee ready in the morning! This multifunctional stainless steel filter can also brew cold or hot tea or infuse water with your favorite fruits! Easy to use: Simply pour coarse ground coffee into the filter basket, add water and allow to steep for 24 to 48 hours. Remove the filter basket and discard the grounds and you have about 1 quart of delicious coffee concentrate. All components are dishwasher safe. Create Concentrated Brew: Our large filter basket allows a highest ratio of coffee grounds to water for any large cold brewer. NOTE: Mason Jar is NOT included. ✔ Smooth Cold Coffee: Make a batch of delicious cold brew coffee. Add coffee grounds, let steep overnight and have cold brew coffee ready in the morning! This multifunctional stainless steel filter can also brew cold or hot tea or infuse water with your favorite fruits! ✔ Large & Durable Filter: The extra large, heavy duty stainless steel filter allows a 1:3 coffee to water ratio that results in a strong coffee concentrate and less acidity. The fine mesh filter prevents grounds from entering the coffee. 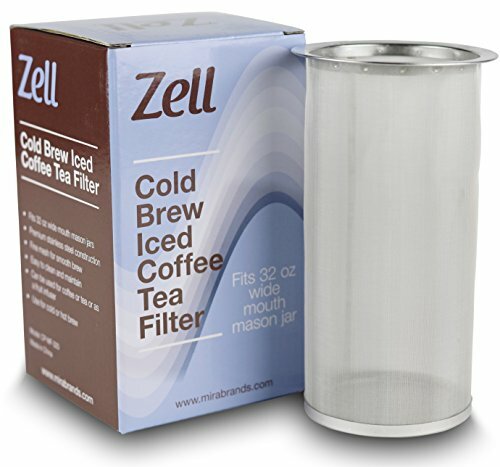 ✔ Fits 32 oz Wide Mouth Mason Jar: Use our Zell fine mesh filter with a 32 oz (1 quart or 945 ml) wide mouth mason jar, like the affordable Ball Mason Jar, to make cold brew coffee, tea or fruit infused water. ✔ Easy to Clean & Dishwasher Safe: Make your own cold brew coffee easily without the mess using our stainless steel mesh filter. Clean up is quick and the coffee maker filter is dishwasher safe, top rack only. ✔ Add to Cart Risk Free: Buy with confidence! Perfect gift for any occasion. We have great confidence in the quality of our products, which is why we are offering you a risk-free purchase. In the unlikely event our product fails to meet or exceed your expectations, you may return our product within the first 30 days post-purchase to receive a FULL refund. If you have any questions about this product by Zell, contact us by completing and submitting the form below. If you are looking for a specif part number, please include it with your message.